Being that it's Valentine's Day, and we are just getting settled into our new home in California, we feel that today is no better time than to share a little bit of our love story with you all... This will be our 8th Valentine's Day as husband and wife, and through the past 8 years we have jumped over a ton of hurdles and endured many changes. One of the biggest changes being moving across the country, twice. Since becoming newlyweds way back in 2011, we have called four houses "home". The military has moved us to a city we didn't know in a moments notice and we've recently taken the big leap to come back home to our roots with no job security. With each move, there has been a huge scary unknown facing us, but we have done it all together, and we have done it all for love. When you enter a marriage, you repeat the vows "for better or for worse/ for richer or poorer". Let's just say that as it goes for our marriage in the past 8 years, 80% of it has been for worse and for poorer. I am not sharing any of this to gain sympathy or pity, it is actually quite the opposite. We as a couple have faced some big downfalls. To be honest, we have even at times been on the brink of giving up. But we never have. These 8 years have been hard, on both of us. When you mix moving (one of life's biggest stresses) and financial issues (one of the leading causes of divorce), you end up with a brewing storm of emotions. And while we are far from being out of the wind and the rain, we have managed to weather the storm together and barely hold on. Our hopes in sharing our struggles and our journey, is to hopefully help another couple out there that may be weathering the same. It is far from easy, but there are a few things we have learned along the way and through it all, love has remained the rope that has held us together. Let's travel back in time to our first move into our first little home as newlyweds, back in 2011. That little 2 bedroom/1.5 bathroom base house was the reason I started this blog of mine. It was tiny, a mere 1,200 sq. ft. at most, but it was a place to call our own (for the time being). Back then, we were nothing but excited and ready to start our lives there. 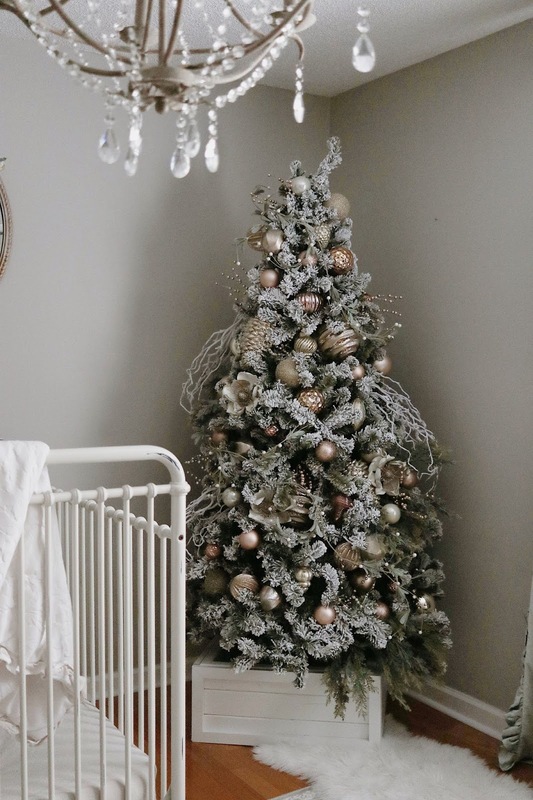 We brought home our first baby to that home, we hosted our first family holiday meal in that home, and we said goodbye to all of our family and friends in that home, before making our way across the country. That home held so many firsts and memories for us and will always be the home where our story began. Fast forward to 2014, we were approaching our 3rd wedding anniversary and awaiting orders from the Marine Corps of where next we would call home. How fitting, that on our anniversary, we received the news... we were going to be headed to Georgia. While I have always loved the idea of living in different places, when you have no choice in the matter and are a planner (and slight control freak) like myself, not being in control of where your life is headed an be testing to say the least! While I never desired to call the state of Georgia home, I tried my best to take it as a new beginning and a new adventure. To leave all of my family and friends behind and everything that I ever knew as comfort, was difficult. On top of that, it wasn't just myself I was taking away from my family, I was a mom, which meant this would change everything about my child's relationship with our family members as well. Driving away after watching our last California sunset, I bawled. So much was changing, so much was unknown. The only comfort we had was a home awaiting for us and my husband's new special duty assignment. Everything else was a blank space waiting to be filled in. I grabbed my husband's hand as we drove away, with tears streaming down my face, I whispered "I'm scared." He didn't say anything in return, but his hand squeezing mine back a little harder let me know that we were in this together. After moving to Georgia, we decided to make the best of it and even started to enjoy our new home state. 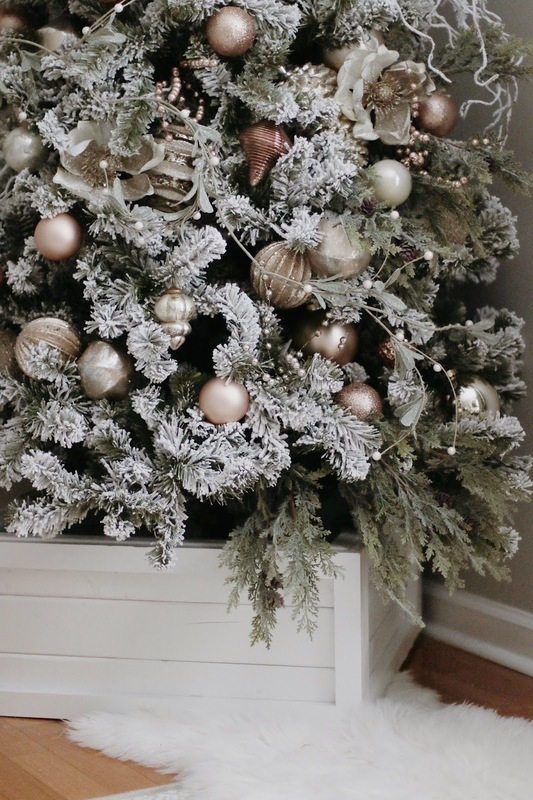 It never really felt like "home" to us, but we made a few new friends, I spent my days decorating our home and raising babies, while my husband worked 18 hour days - 7 days a week. We somehow made it through our 3 (long) years on marine corps recruiting duty. I won't go into details (in this post) but those 3 years were probably the hardest of our marriage. We went through a lot between 2014-2017 and after serving 10 years in the Marine Corps, my husband decided it was time for a change. He packed away his uniform and boots and we settled on trying out Georgia as our home, in civilian life. At the time, we were perfectly content living in our rental and were even talking about buying that home once Derrick was able to establish a stable civilian job income. But soon, all of those plans were derailed. Just a month after EASing from the military, we received news that the owners of our home were selling and we needed to be out asap. So add finding a new home on top of finding a new job/ jobs. We were hit with a ton of bricks. No money saved, no guaranteed job in sight, no idea where or how we would find a new home, at that point everything in the future was unknown. We had no idea what to do, but pray. We knew that no matter what we were facing, again, we would face it together. Eventually, we did find a house, it was run down, in horrible condition and needed a whole lot of work just to move in, but it was a roof over our heads. We tried our best to clean that rental up as best we could, then made it into our own with paint and filled it with the things we loved. Soon, it felt like home. As for the job search, in 2017 Derrick worked three jobs just to make ends meet, until finally getting hired on with our county police department. We were still far from making it, but we were somehow making ends meet. We still knew that Georgia wasn't our forever home, but we started to become content in where we were. Until mid 2018... I started to feel the urge to want to be back home. To raise my children near family, to seek larger opportunities for my own career. We started talking about all of the many reasons that California felt like the right decision. The one big part though... we sure didn't have any money saved up and financially were not in the position to save any to make the move happen, and secondly California is extremely expensive and would require both of us to make triple our current income. There were so many pluses, but one huge financial obstacle in the way. It took months of talking and weighing options to come to our decision but Derrick was willing to move back to California for me, for our kid's sake and for our future. We sold most of our large furniture and tons of other things around the house just to fund our move. We took a huge leap of faith and trusted in each other that we could make this work. 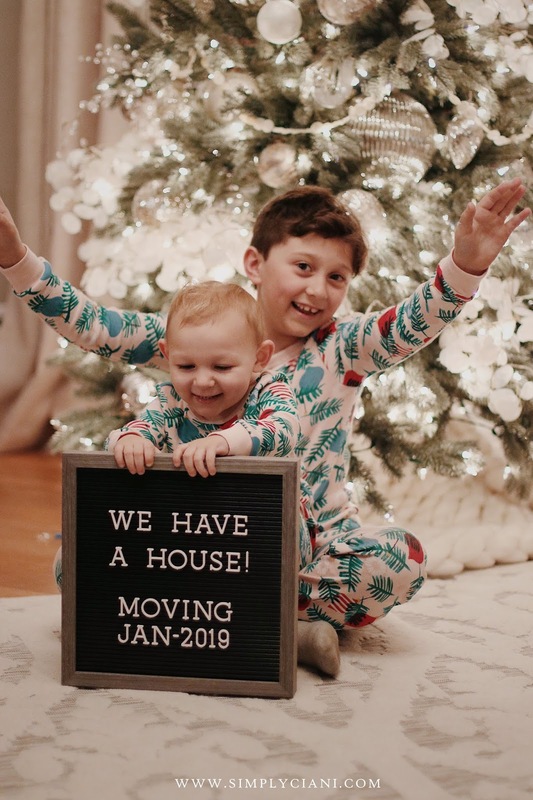 At the end of January 2019, we loaded everything we owned into a 26 foot moving truck and drove across the country. Ironically, we celebrated our 8th wedding anniversary on that road trip, stopping somewhere along the way for McDonalds with the kids and enjoying our "anniversary celebration". Now, here we are, just 2 weeks (as of today) settled in our new home in southern California. We have been surviving on the last little bit of money we saved from selling nearly everything we owned and a bit of help from family. We took a huge risk to get here but still feel it was the right decision. Through it all, we have both made sacrifices. Were we both happy through all of it? Far from it... We have had many many arguments over the years. But we made it through, together and relied on our love to guide us. Lean on each other - Moving or any big life change is stressful enough. In times like these we can often try to find blame to put on the other person, to take out all of our fear and anger on our significant other. Try to understand what your significant other may be facing and if you do find your relationship in a downward spiral, take a moment and try to pinpoint where those hurtful words or actions may be coming from. Often it is much simpler. Realize you both are climbing the same mountain and help boost each other up until you reach the top. Give each other space - Sometimes moving, wether before or after, can bring up a lot of emotions. 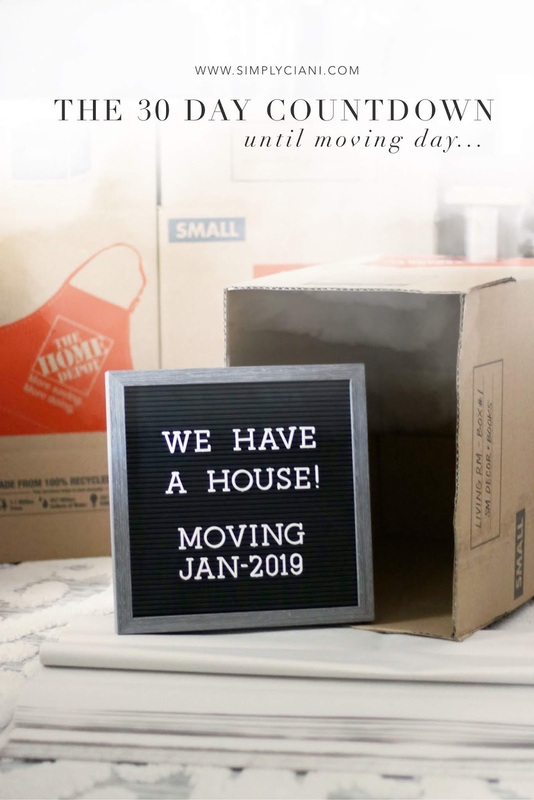 You are either freaking out about the million things on your to-do list before move day or you have held it all together and are now settled into your new home and are emotionally and physically drained and all of those hid away feelings come bubbling to the surface. Sometimes the best thing you can do for yourself or your significant other is to get out and do something for yourself. Maybe it's a long walk, or 30 min just to sit in a local coffee shop by yourself or a long drive with music blasting. Allow yourself a moment to clear your head and reset. Talk it out - I can't even count how many times one of us has blurted out something hurtful to the other. for example, just this week D yelled out of frustration, "Screw this, we will never get out of this hole we are in, moving here was a horrible mistake." I knew he didn't mean it, but I did understand where that frustration stemmed from. It stemmed from the stress of knowing we took a big financial risk to move here and now we have no option but to make it work. On top of that, my husband finds his identity in his work, with not working full time right now and with the fear of not being able to provide for his family, he takes all of this stress on his shoulders and many times we all can take out our frustrations in not so nice ways. I knew once this comment was made, we needed to talk. I needed to be there to reassure him why we made this move. I had to give him faith that this would all work out in the end, and in the meantime, we are on the same team. Talk out your frustrations, talk out your fears, talk out your plans. Be the pillar that the other one needs. If you are facing a move in your future, or maybe just treading through some big changes in life right now, I hope that you know that you are not the only couple going through this. You are not alone in feeling like you just can't see the light at the end of the tunnel some days. Just remember you and your significant other/ spouse are in this together and you will get through it together. With a little grace, a little sacrifice, a little trust and a little love. 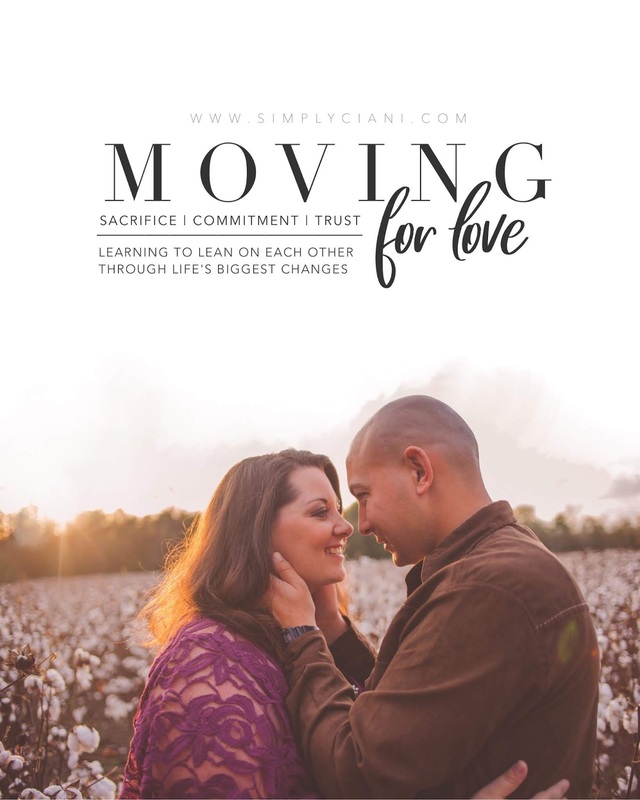 Are you MOVING FOR LOVE? If you have been following our moving series, you might be a little confused based on last month's move update, we went over how we were approx. 3 months out from moving. Now here were are, announcing we are just 30 days (actually less) away from move day! So you might ask, what changed? *This post is sponsored by Homes.com - all thoughts and ideas are my own. Well... We have a house! While I had full intentions of taking you all along the final house search process with us, this specific home presented itself while doing just a quick browse on Homes.com last week. We have had no plans to even begin contacting available rental homes until January, but this one seemed perfect so we went ahead and inquired. To our surprise, they got back to us nearly immediately and thus that is when this surprise whirlwind of finding our perfect home began. As stated in my last move update, I went over the challenges you can face when trying to find a home/ rental while living in another state along with how to set yourself apart from the many other (local) applicants. One of the biggest tips I have for securing a home from out of state or in a unique situation, is to find a home listed by the landlord/ homeowner. 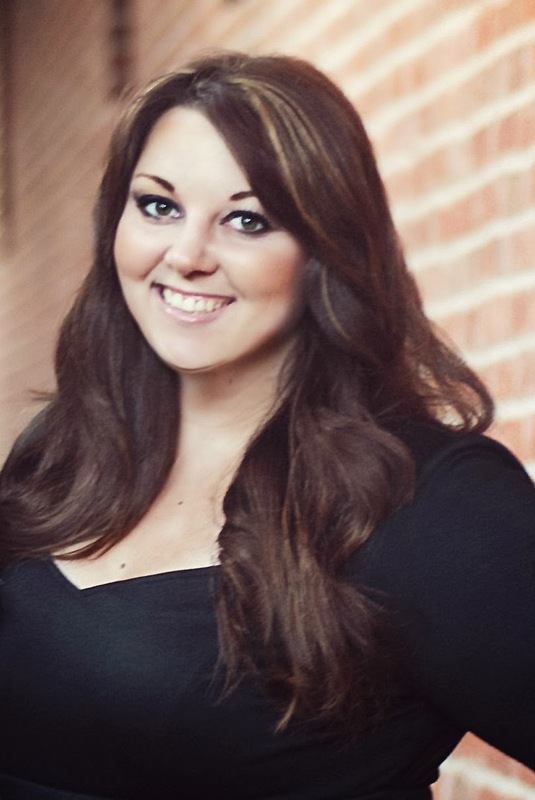 This allows you the chance to connect with the person owning the home and present your situation to them, and more often than not, they will be more open to holding a home for the right person/ family, accepting a not so excellent credit score or a new job change over a property management company who is just approving applicants based off of a checklist. In this case, as well as when we moved to Georgia, both homes were listed by the homeowner. In both situations we were able to talk on the phone to the homeowners and explain our moving timeline and also let them know a little more about our family and who we are as renters. So let's get back to our home search journey... After talking to the homeowner, we set up a time to do a video tour of the home via FaceTime. Being that we are moving back to California to be near family, we knew that we had people whom we trust to go view properties for us in person. But... My dad has been here visiting us for the holidays, and when this home presented itself, we were informed that there were already 2 other applications in that they were considering and they needed to make a decision soon. The homeowner graciously walked us through the entire home, then outside to show us the neighborhood, nearest playground and community pool to really get a feel for where we would be living. After the tour I think both my husband and I knew instantly that this home was for our family. We sent an email saying that we would like to apply. But, we knew there were still a few obstacles in the way. First off, those 2 other applicants were local and could move in immediately. We on the other hand, hadn't even prepared to start moving until mid Feb! Not to mention my husband starting a brand new job, and not knowing how our credit score would hold up against the other applicants. We decided to give them a call and explain everything up front before ever submitting the application. Being honest and transparent is key if there is anything you are concerned about when applying. Secondly, I sent the homeowner an email with links to my social media and blog, to show how we care for our current home and how we plan to love and care for their home as well. 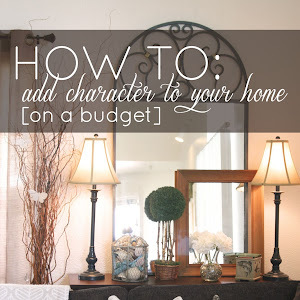 Even if you don't have a blog or social media account where you share your home, send an email with possibly a collage of a few photos of your current home and a photo of your family. This gives them an idea of who will be occupying the home that they cherish. Renting from a homeowner is so much more personal, so try to connect with them on a personal level. After all was sent off, we received the news within 24 hours, on Christmas Eve of all days... that we were accepted! Then came hammering out the details. I won't go into financial detail here because of personal reasons, but the homeowners graciously discounted our deposit due to a long distance move, but we did have to pay to hold the home until we could move in. This has now pushed our move date up by quite a lot! We now will be moving across the country in less than 30 days! Follow along as I share a few of the tips that I have learned through my past moves and how I plan to incorporate them into this one. There is so much information that I have actually split this post into 2 parts. 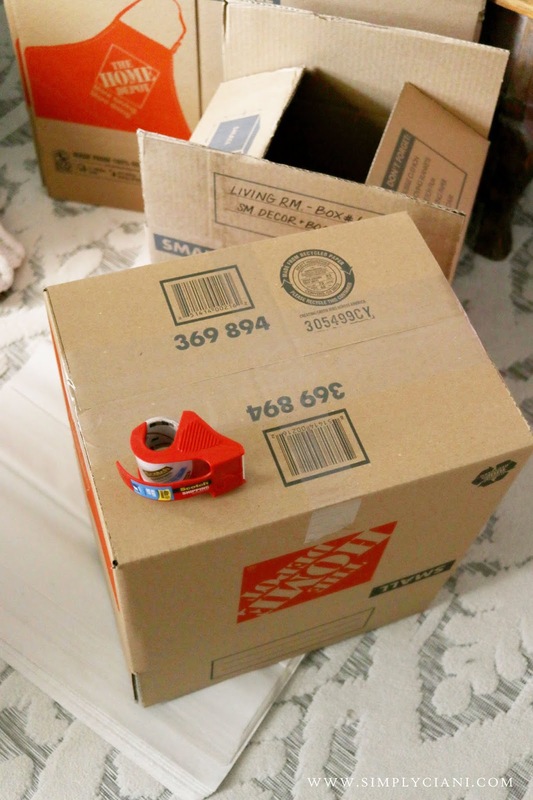 Part 1 being everything you need to know to get your home packed up and ready to move. 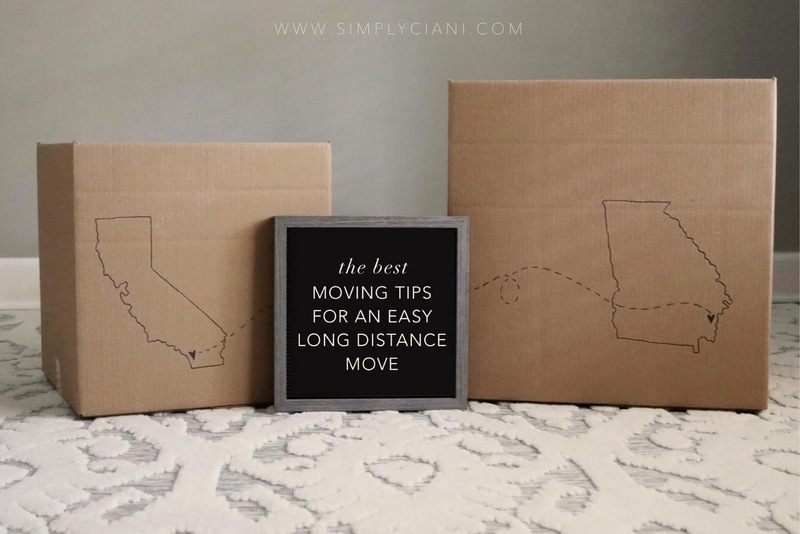 Everything from packing materials to how to pack each room and what you need upon moving into your new home. Part 2 being the logistics of moving. 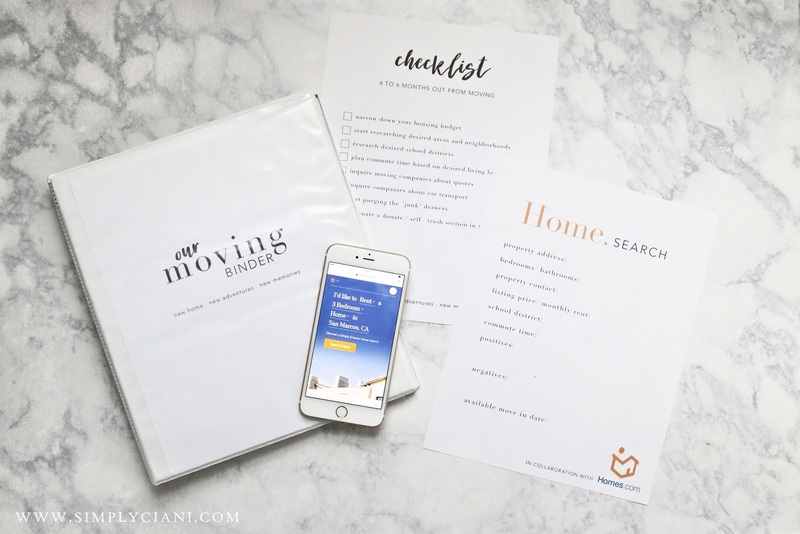 In that post I will take you through a breakdown of moving yourself vs. hiring a moving company, traveling long distance to your new home, and how to do it all on a small budget, along with a to-do list of what you need to do before moving out of your current home. 25 Boxes - Garage, Laundry Room & Misc. The quality of your moving materials also matters. 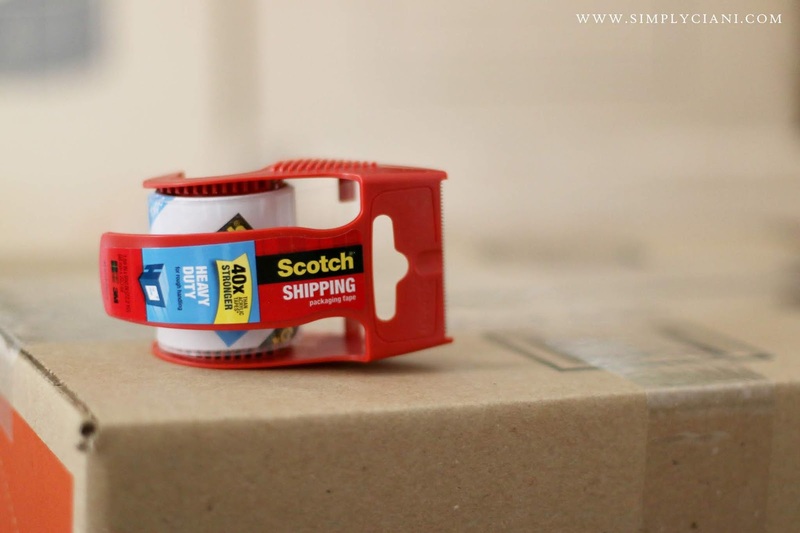 Sturdy boxes and tape will insure that your items will arrive at their destination in perfect condition. And how you tape your boxes also is of importance. The last thing you need is the bottom of your box to fall open after you spent all that time wrapping up your belongings. Begin by taping the box once, across both flaps. Then tape once down the center line, then again on either side of that, overlapping the sides of the tape to create a strong hold. Again, the tape you use will make a difference. I've done this same method of taping but with a dollar store brand before and I was sorry I did... My advice, splurge on the good tape. Lastly, label each box so that it has a final destination and anyone picking up the box can figure out where it goes. 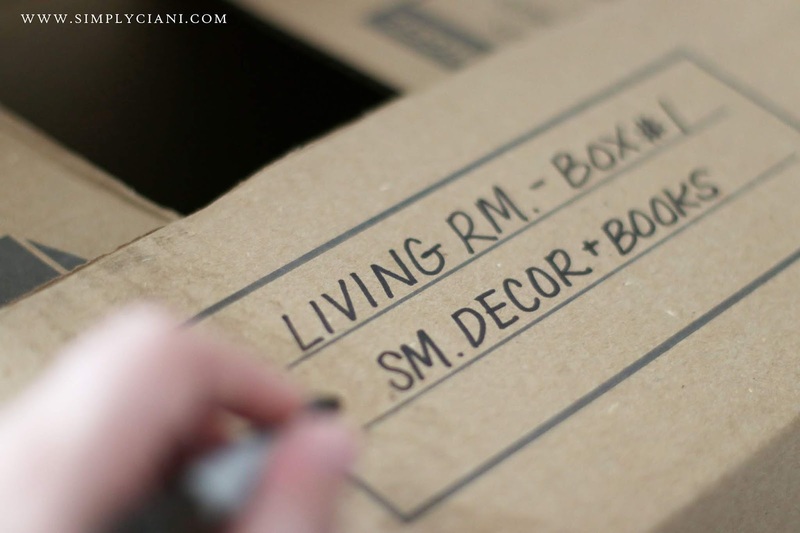 Label the boxes not as where they came from in your current home, but where you want them to go in your new home. I label each box with the room, then number each box for that room, and label the main contents in that box. I also have a checklist that I have created of all of this info that I can relate back to and check off as I un-pack, just in case a box gets misplaced or I can't find what I am looking for. One other tip - Because we don't have a craft room or a play room, but have lots of craft items and toys, I box all of those items up grouped with similar items. Such as: "Crafts - Paper", "Crafts - Painting", or "Crafts - Wood". And for toys that don't have a place in either of the kid's rooms, I label those, "Toys - Hotwheels" or "Toys - Dress Up". On move in day, I have these boxes placed in the main entry or in the garage until I find a place/ closet to organize them. 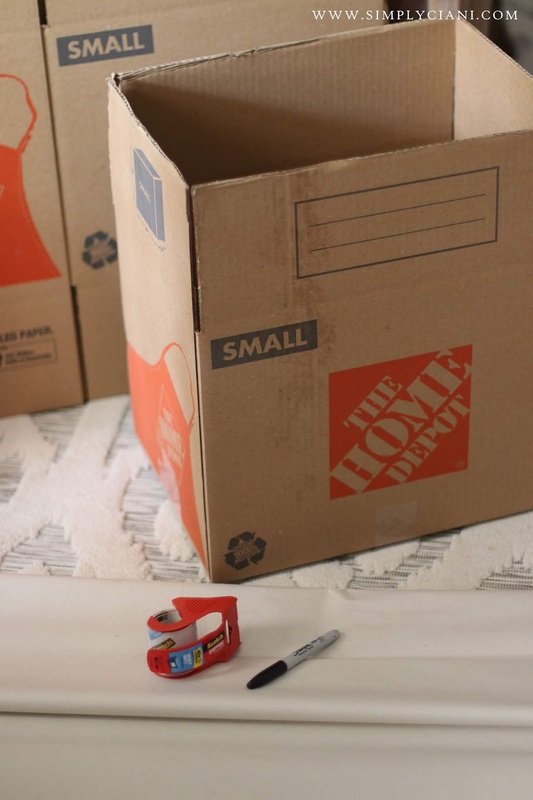 As I went over in my last update, one of the biggest things you can do before a big move to make moving as easy as possible, is to purge the "junk". I went through round 1 with you, which was the hard part. Round 1 consists of taking inventory of what you have, what you haven't used in years, what you can live without, and what is just plain trash. After getting rid of and selling everything you could do without, now it's time to really think about what else can go. 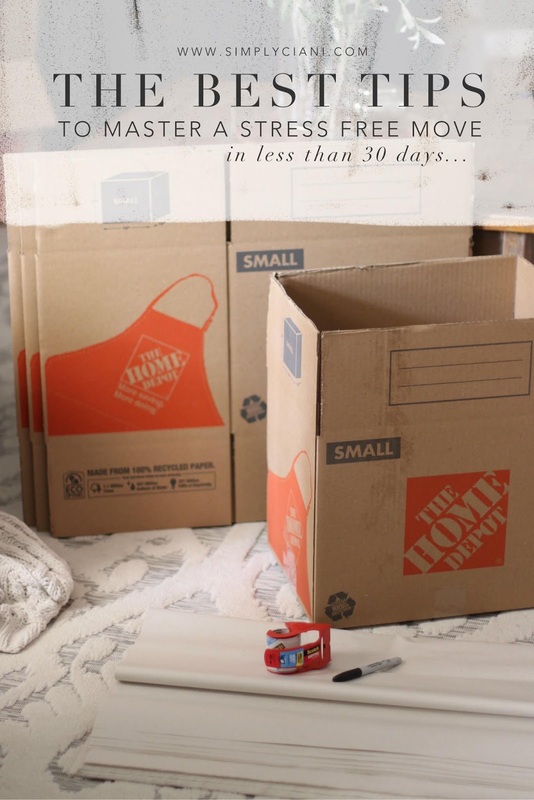 If you have a home (which you should being 30 days out from a move) you know the layout. Which furniture that you currently own won't fit or work into your new space? 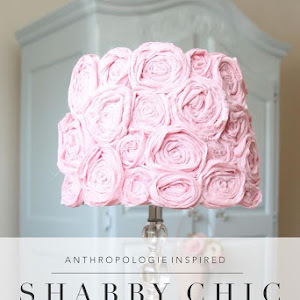 Maybe you want a slight style style change, what can you possibly sell and use that money to buy something new that you love? Or take a hard look at your closet, can you let some of it go? I like to call round 2, the "make room for more" round. You have to let go what is weighing you down sometimes to make room for something even better. Moving into a new home, one you have worked hard for, this is a new chapter, a new beginning. Now is the perfect time to let go of the things you maybe have held onto for too long just because it is "stuff". Want to know another great thing about letting go? Well, it sure lessens the cost of your move! The lighter the load = the less that you pay. For us, we have saved the big items to get rid of, for last. Now that we have the layout of our new home we know what we can take and what needs to be sold. A plus of our new rental is that it comes with a washer and a dryer so we will be selling ours, along with our large dining table and other furniture items we know will not fit into our new home. What is fun about the purging process is that we always use the money that we receive from selling the old to buy new after we move. We get to go shopping without really spending! 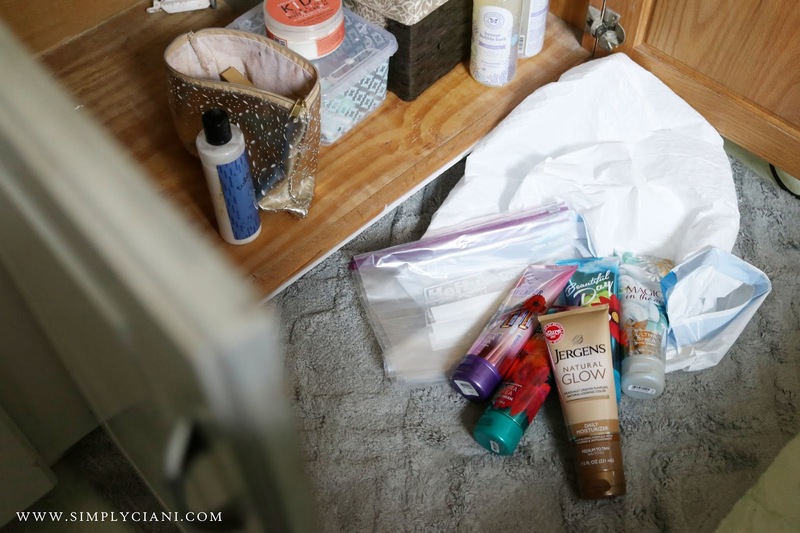 Once you have sold/ donated all of the big stuff it's time to take a look at all of those things you have been hoarding for much too long: When it comes to anything in your bathroom cabinets, lotions, hair product or makeup, if you haven't used it in 6 months - a year, its time for it to go. Same goes for clothing, if you haven't worn it in a year or if it doesn't fit, let it go. And as for kitchen items that we all know can gather up over time, if you haven't used it in a year - 2 years, its time to be used by someone else. Downsizing can be hard and it can feel overwhelming when it comes to deciding what to keep and what to let go of. But with each one of my moves, I have never regretted letting go of any of the items I decided to part with. Just keep your new home in mind through the whole process. Think of how everything needs a place to go and if you don't have the space or room for it, let it go. If you don't absolutely love it and that item no longer brings you joy, let it go. And if just even starting the purging process feels daunting, I suggest starting in the bathrooms. then closets, then dressers, then the main areas of your home. One bag/ box at a time, and you will get there, I promise. Just trust your gut. If you have children, especially young ones, moving can stir up a whole boat load of emotions. My biggest tip when facing a new change - get them involved with the packing. Let them choose which items they want to pack up and make a game out of it! 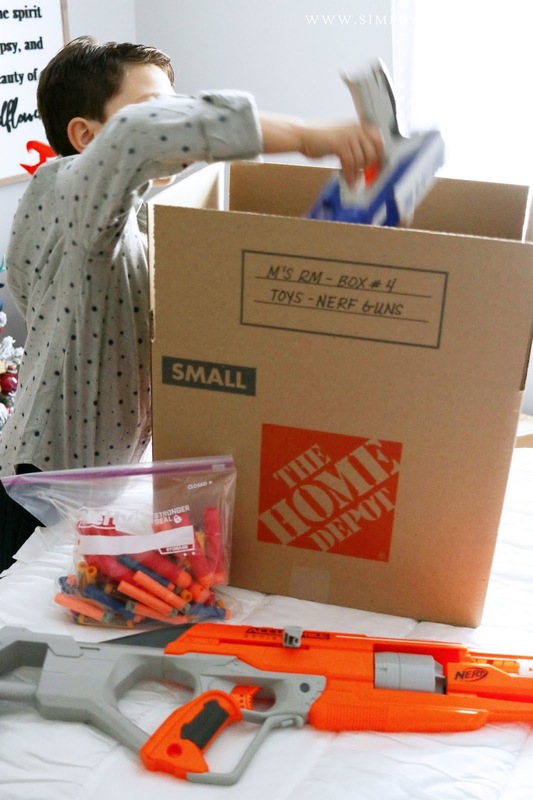 Try to see who can pack their boxes faster or count how many items fit into a box, or sort toys by colors. The more you involve your children, the less anxiety they will have. Bathroom - I always start in the bathroom because it is the smallest room in the home and usually has the least amount to pack. (Ziploc bags will be your best friend!) I first pack up all liquids and lotions, each in their own separate Ziploc bag. I always place those in a box by themselves, separate from everything else. Closets - I begin by packing clothes first, leaving the clothes on the hangers, placing a plastic trash bag over them and placing each group of clothing into a box. Dressers - As for clothing in dressers, we have never packed our clothing, we first take out the drawers of the dresser on moving day, load the dresser, then place the drawers back in them with the clothing still inside. 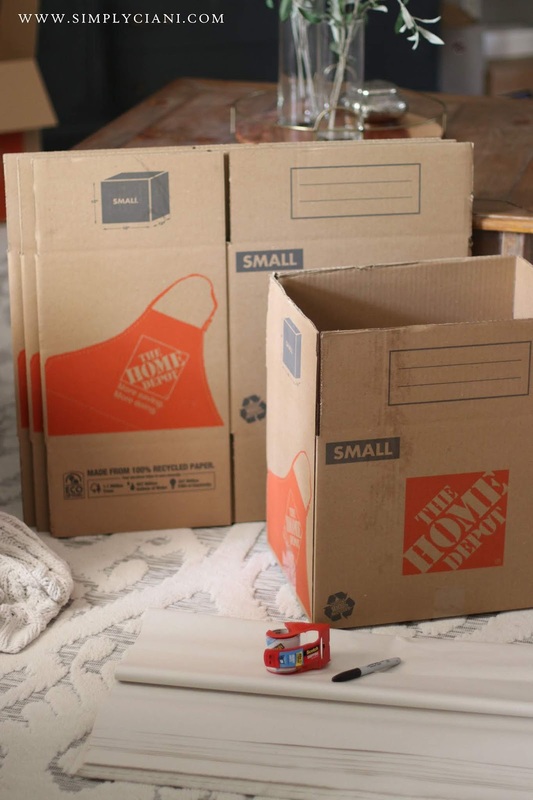 As you fill up the truck, the other furniture and boxes will insure that your drawers will not open and it/s one less thing you don't have to worry about packing! 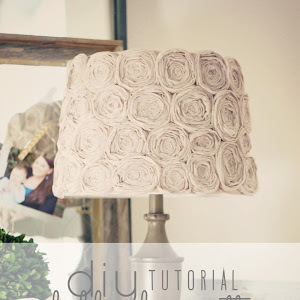 Decor - I always wrap breakable decor up with quality packing paper. Each item gets wrapped individually. Dishes - One of the easiest tips I have for packing dishes is to place a foam paper plate in between each plate, then wrap the whole set up in bubble wrap. For coffee mugs and breakable glasses, wrap with packing paper and pots and pans wrap up with extra bath towels. Bedding - When it comes to comforters, duvet covers, etc... I always pack each bedding set together. Including throw pillows. This way, once your beds are all set up, it is easy to put each one together again. 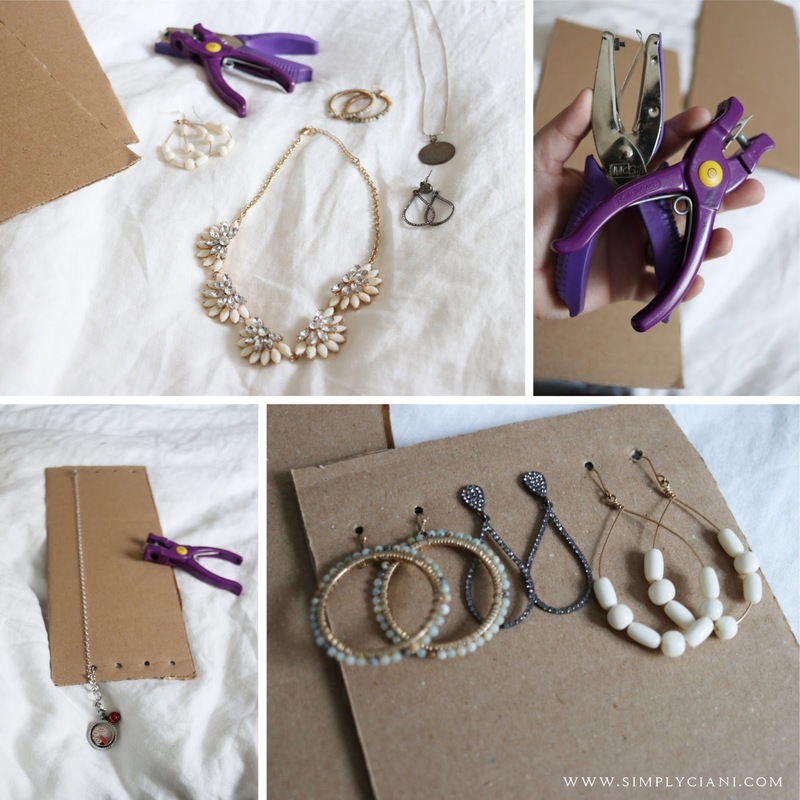 Jewelry - For jewelry that I won't be taking with me in the car, I like to use scrap pieces of cardboard, then using 2 different sized hole punches, punch holes into the cardboard for where I would like my jewelry to be held in place. This makes it so that necklaces, earrings and bracelets won't get tangled up in the move. For additional packaging, you can wrap the entire piece of cardboard up with plastic cling wrap as an extra step to keep the jewelry in place. 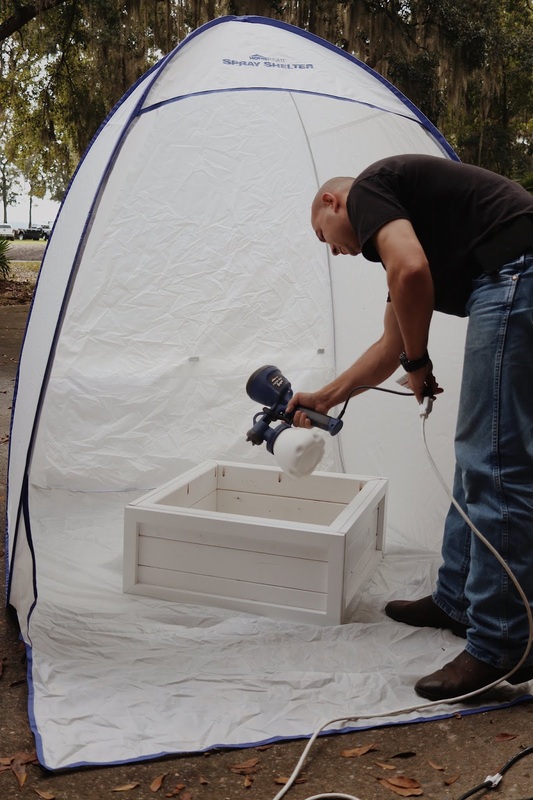 Garage Items/ Tools - Packing plastic wrap is great for keeping rakes/ mops/ brooms together but when it comes to the tools, we have chosen to purchase large plastic totes to insure that none of our tools get damaged in the move. Plus it makes for easy organizing after moving into your new home. These are just a few of tips that I hope you find helpful. Ones I have learned after making things much harder on myself over the years, when moving and entire household on a short time frame. Stay tuned for part 2 of this series, coming soon! Thanks for stopping by! or download the Homes.com app for even more house hunting features. 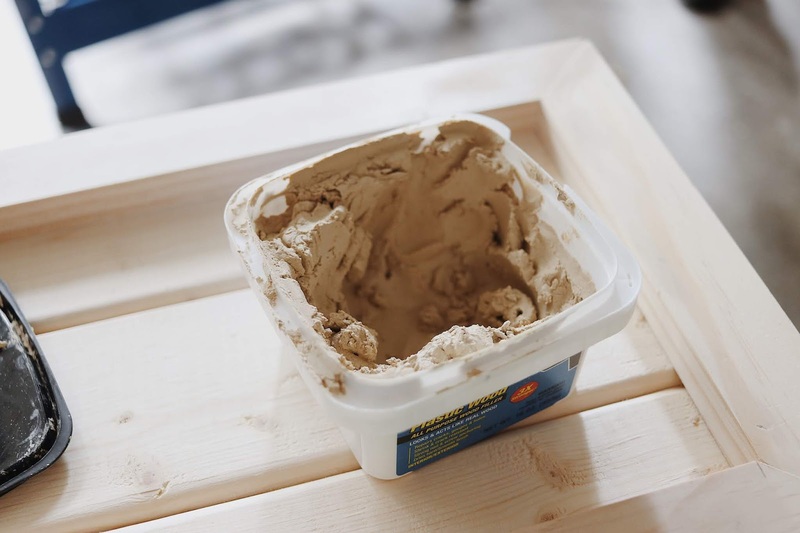 *This post is sponsored Kreg, all creative ideas and plans are my own. In the weeks ahead, we will be releasing 12 easy to follow plans for DIY home decor as well as gifts to build for others this holiday season. 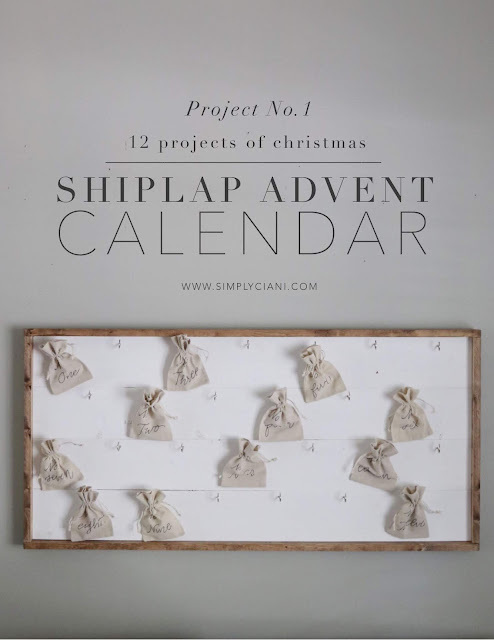 Our goal was to create a holiday series that is for the DIY enthusiast, weather you are a beginner builder or a master, these plans are for all skill levels and will walk you through how to use each tool. 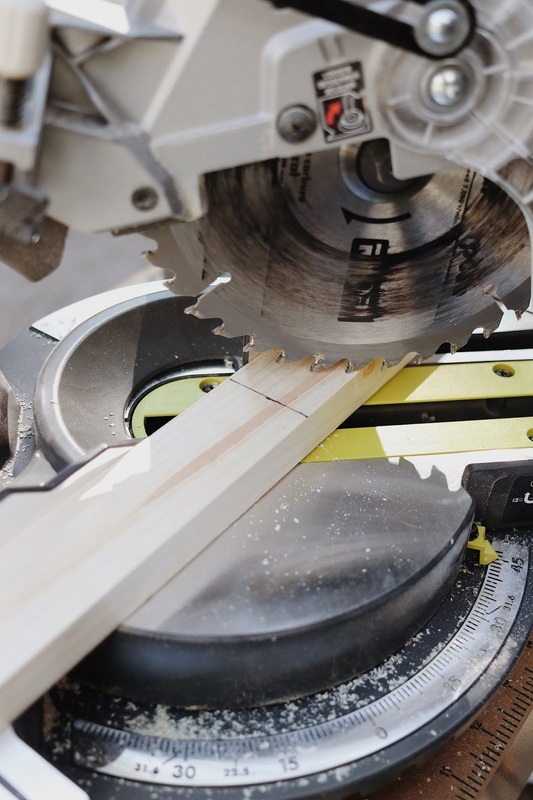 For the overlapping (longer) horizontal sides: Laying your 1" x 2" board flat on the 2" side, cut one end of your 1" x 2" trim using your miter saw set at a 45 degree angle miter cut. 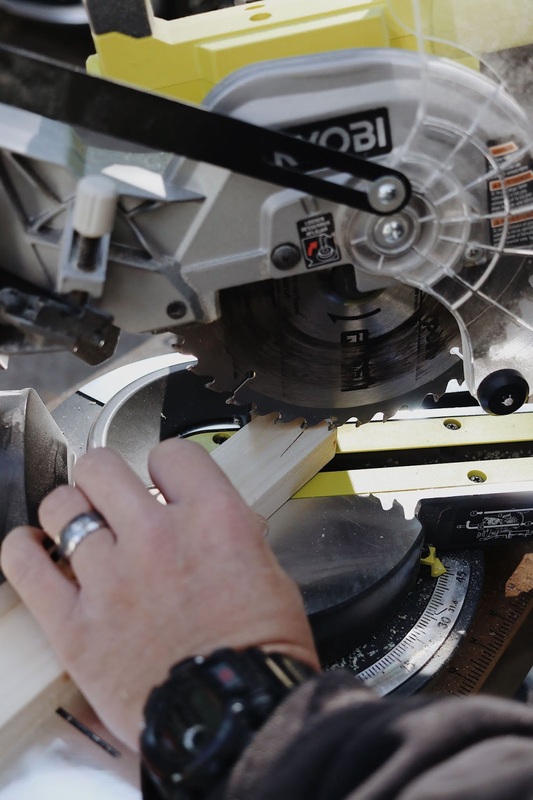 After one end is cut, flip your board over and then from the longest point of that angle, measure down your board 24-3/4" and make a mark. You will then make another 45 degree cut. 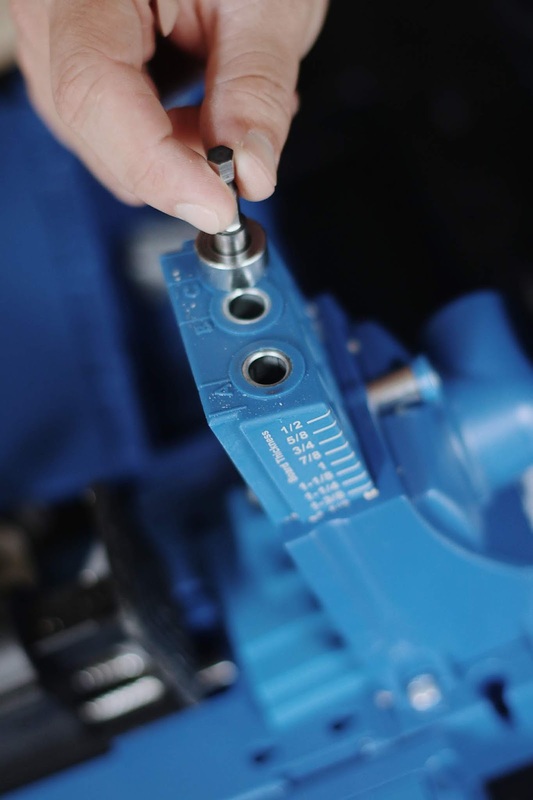 Repeat this process until you have 4 identical trim pieces. 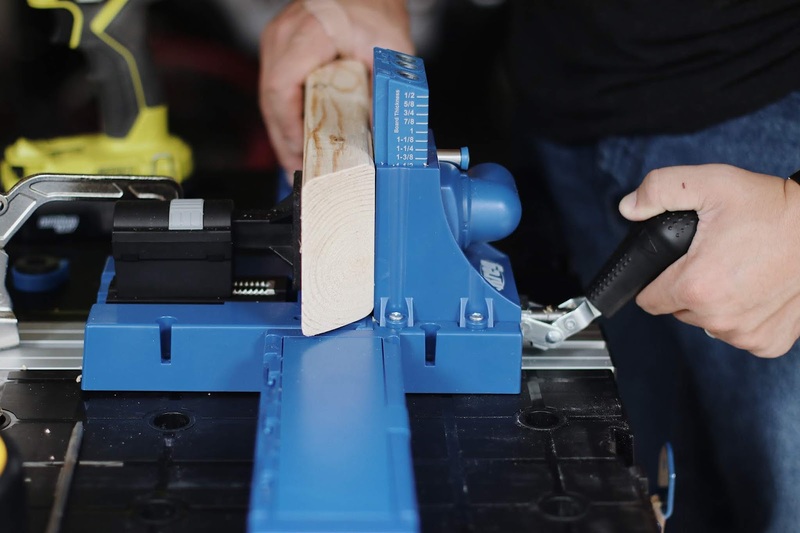 For the flush (shorter) horizontal sides: Laying your 1" x 2" board flat on the 2" side, cut one end of your 1" x 2" trim using your miter saw set at a 45 degree angle miter cut. 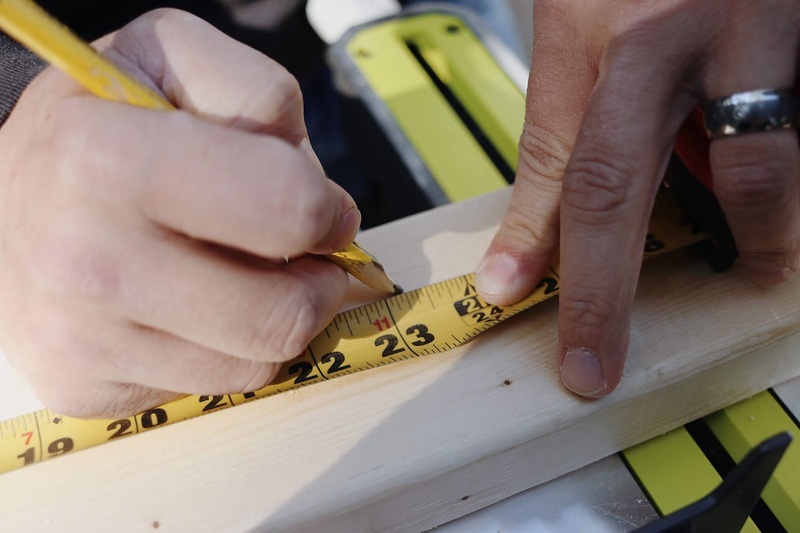 After one end is cut, flip your board over and then from the longest point of that angle, measure down your board 23-1/4" and make a mark. You will then make another 45 degree cut. 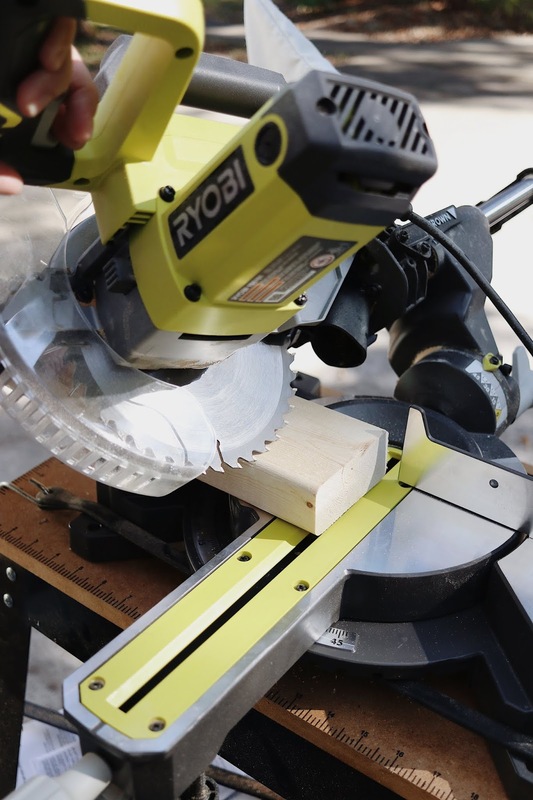 Repeat this process until you have 4 identical trim pieces. 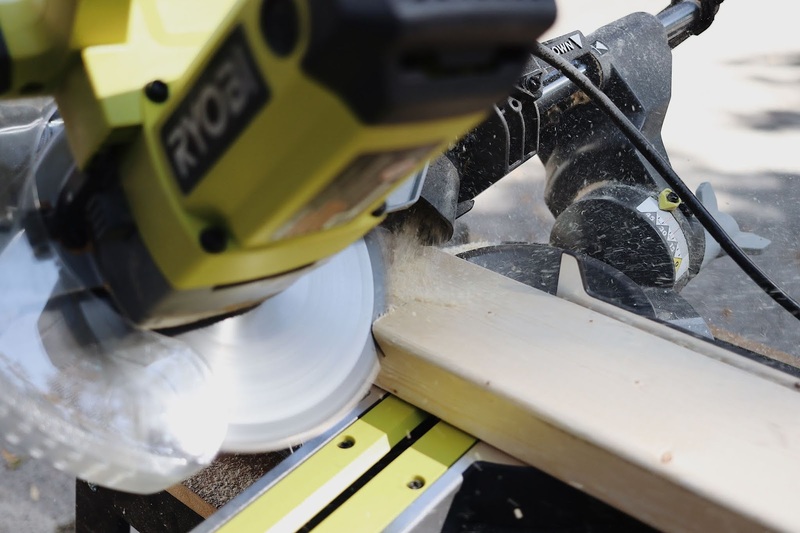 For the vertical sides: Laying your 1" x 2" board flat on the 2" side, cut one end of your 1" x 2" trim using your miter saw set at a 45 degree angle miter cut. 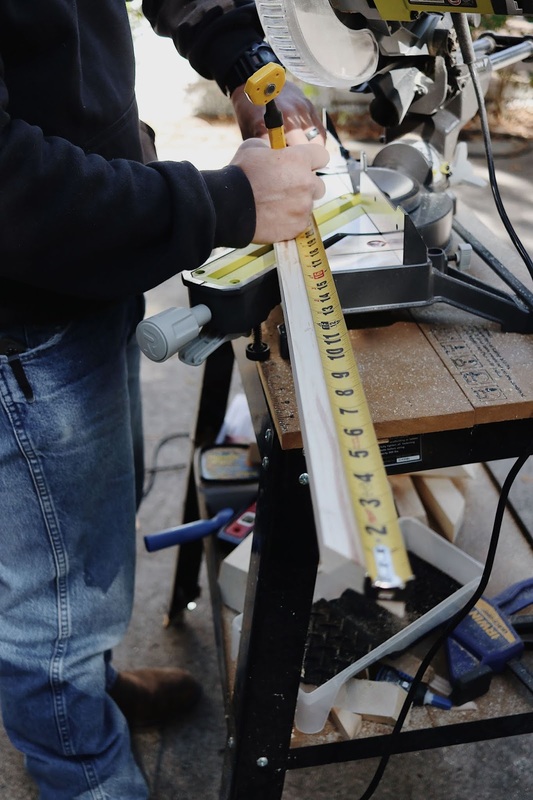 After one end is cut, flip your board over and from the longest point of that angle, measure down your board 10-1/2" and make a mark. 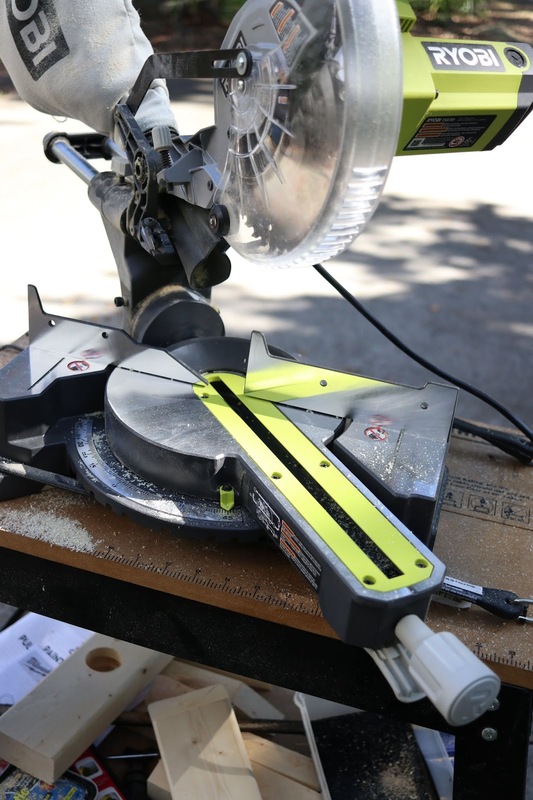 You will then make another 45 degree cut. 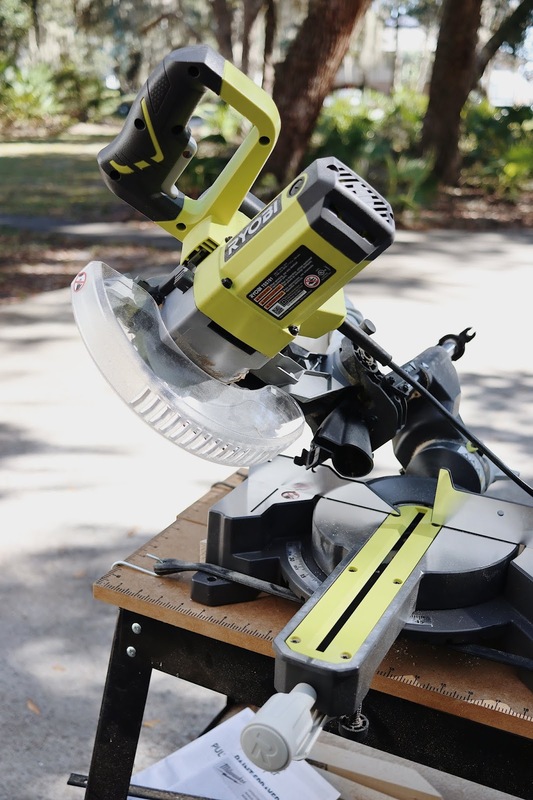 Repeat this process until you have 8 identical trim pieces. (you will then flip your board over to the opposite side and slide it to the right. 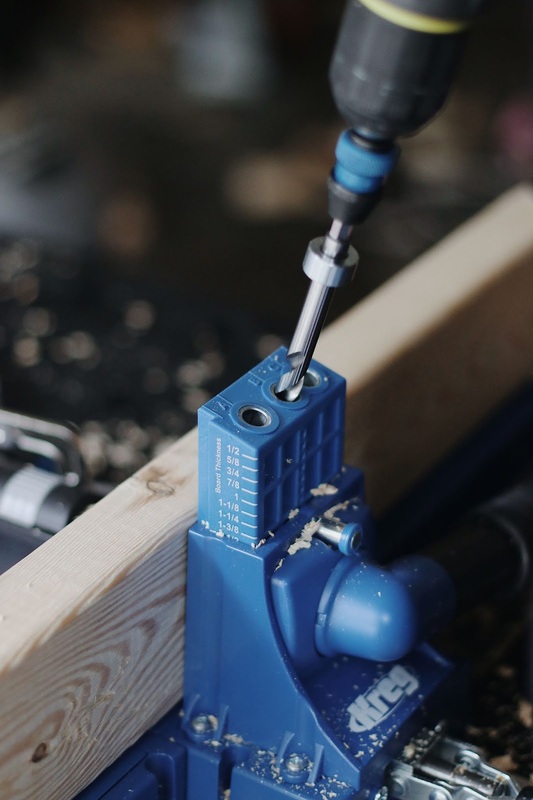 Step 3: Before drilling your pocket holes, begin by first setting your Kreg Jig K5 to 1-1/2" and drill bit to accommodate a 2-1/2" screw. 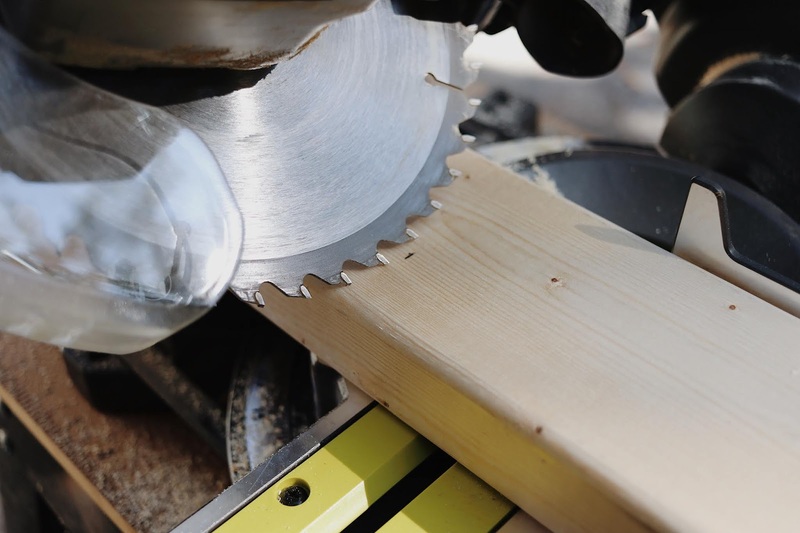 Step 4: Begin drilling your pocket holes into the top and bottom 2" x 4" boards of your sides only. 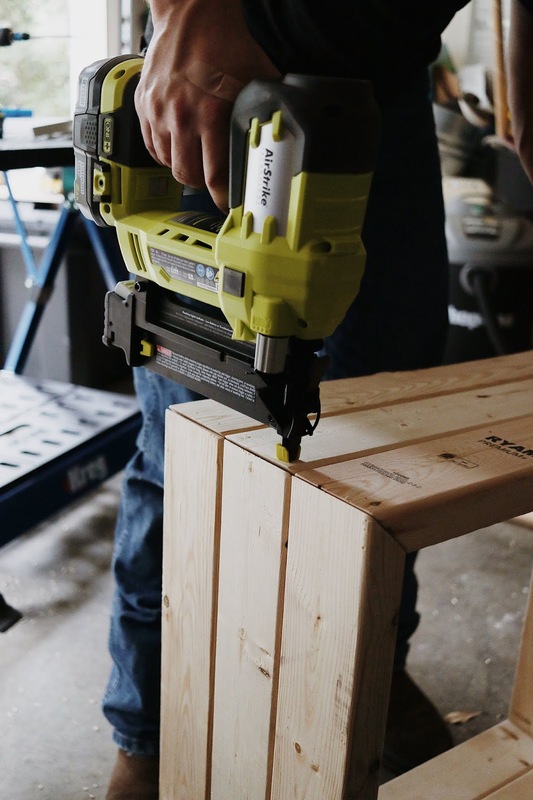 Drill 3 holes evenly spaced, each one should be leading into the middle board once you place them together. 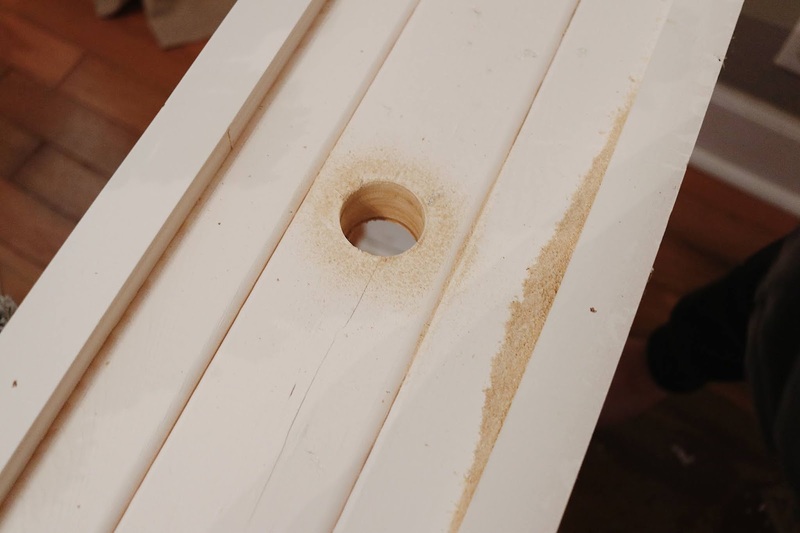 Step 5: Screw your boards together using your 2-1/2" Kreg screws. Step 6: Once your sides are assembled, you are ready to attach them together. 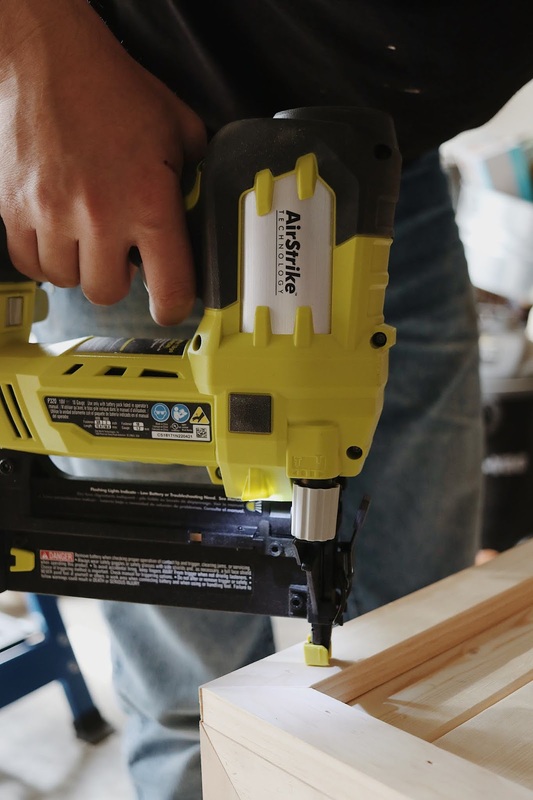 To do this, you could use pocket holes to attach them, but this time we opted to use our braid nailer with 1-1/2" brad nails, shooting the nails into each end where the angles meet. 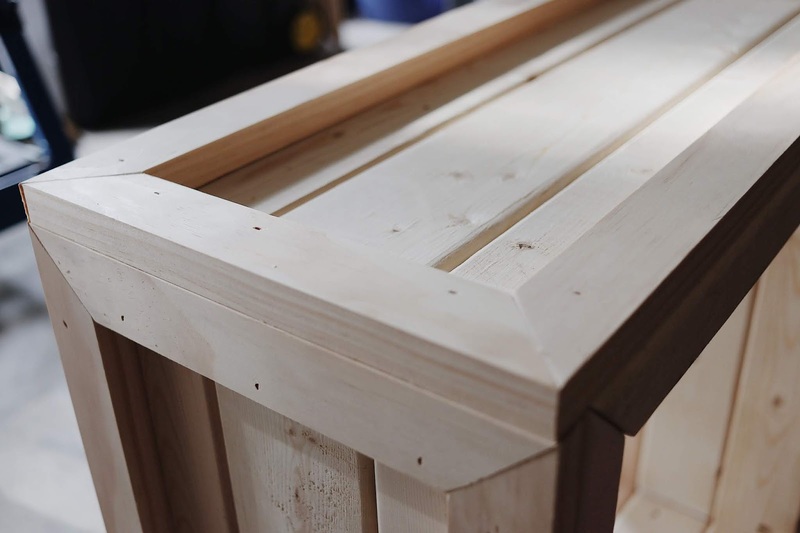 Step 7: (1) After your sides are securely attached together, lay your box flat on one side and place (2) of the shorter horizontal trim pieces and (2) vertical trim pieces flush so they meet evenly with all sides of the sides of the box. 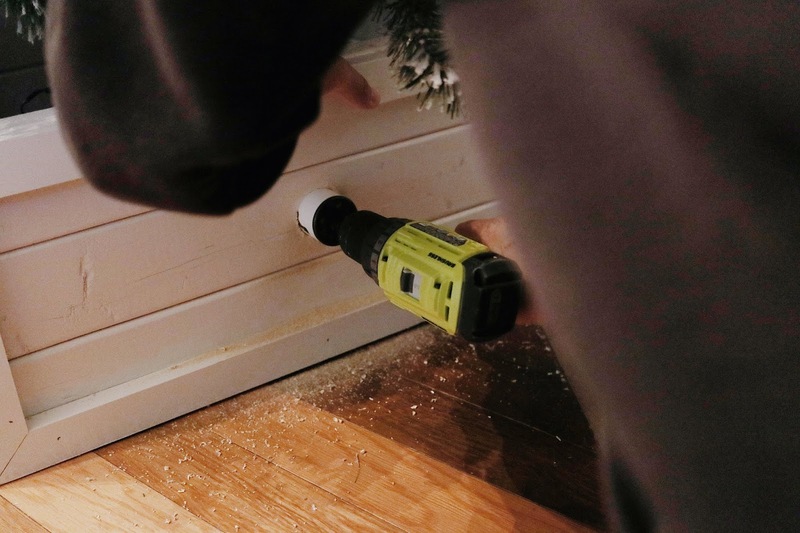 Nail down using 1-1/2" brad nails and your brad nailer. Flip your box to the opposite parallel side and repeat this process. 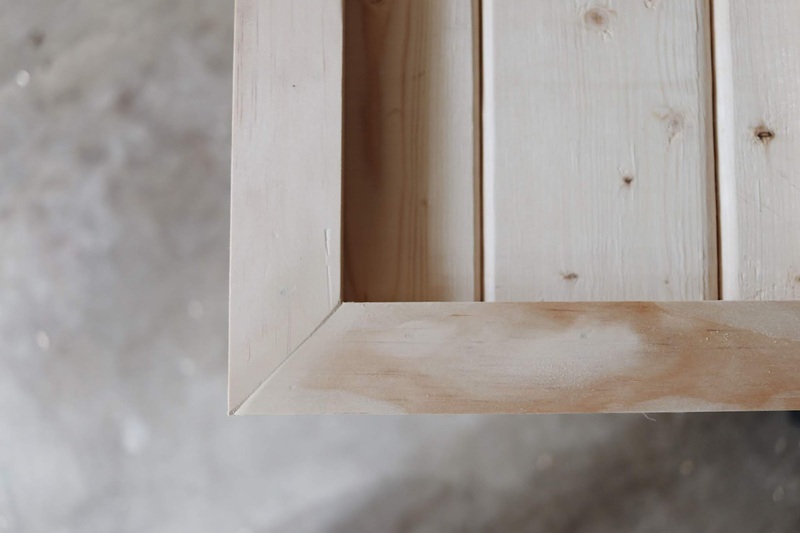 (2) Once flush sides are trimmed, flip the box to the adjoining side, this will be where you add the longer horizontal trim. 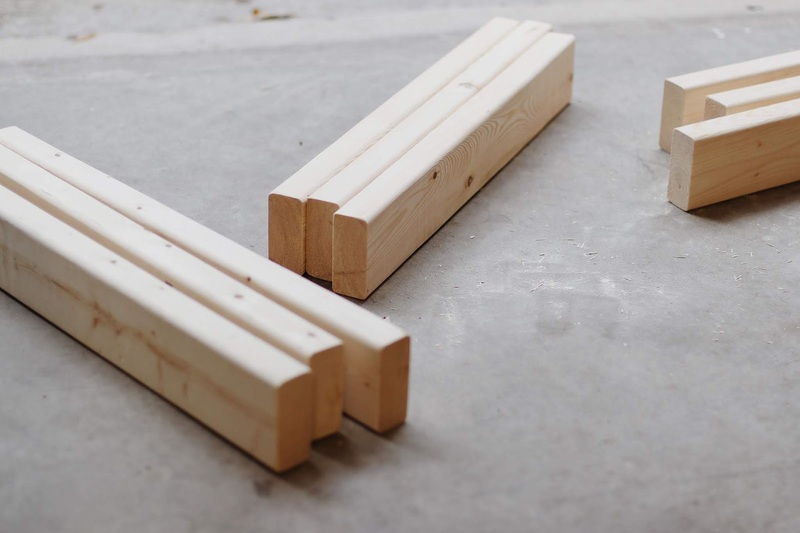 Your (2) longer horizontal trim pieces and (2) vertical trim pieces should overlap the trim on the joining sides. 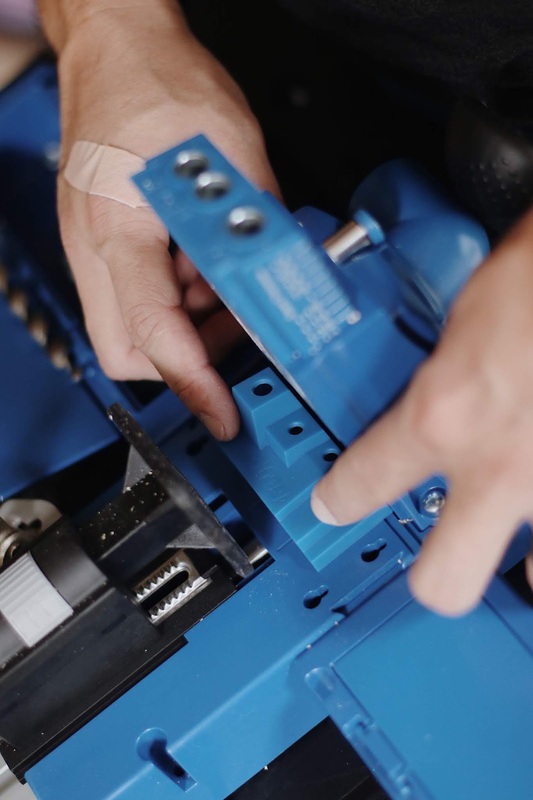 Nail in securely with 1-1/2" brad nails and your brad nailer. Repeat this process on the opposite side. Step 8: Your box should now securely be put together! The last step is optional but it sure makes hiding those cords a breeze... Lastly, we used a 1-3/4" HOLE DOZER to drill out a hole in the back center 2" x 4" board. Step 9: Fill all gaps and nail holes with wood putty. Then sand to smooth one dry. 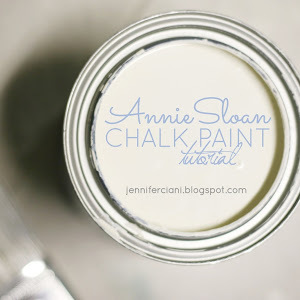 Step 10: Lastly, you are ready for paint, or stain. 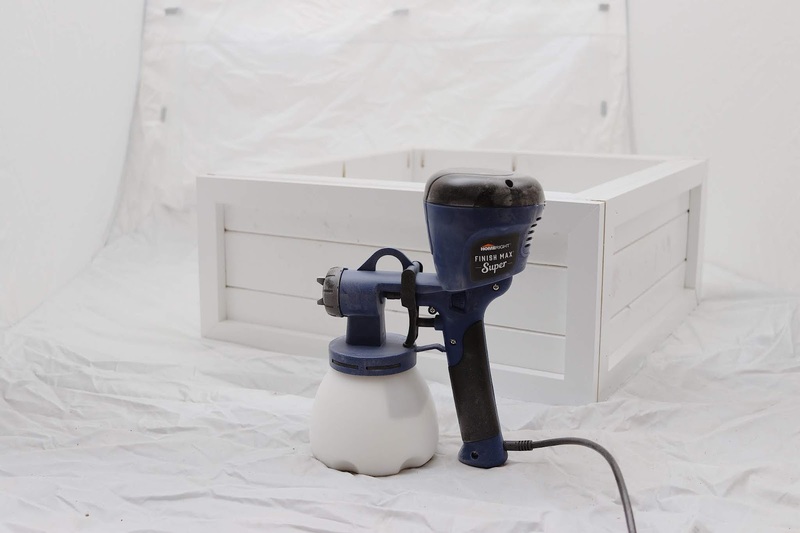 For this project we whipped out our HOME RIGHT FINISH MAX PAINT SPRAYER and HOME RIGHT MEDIUM SPRAY SHELTER. 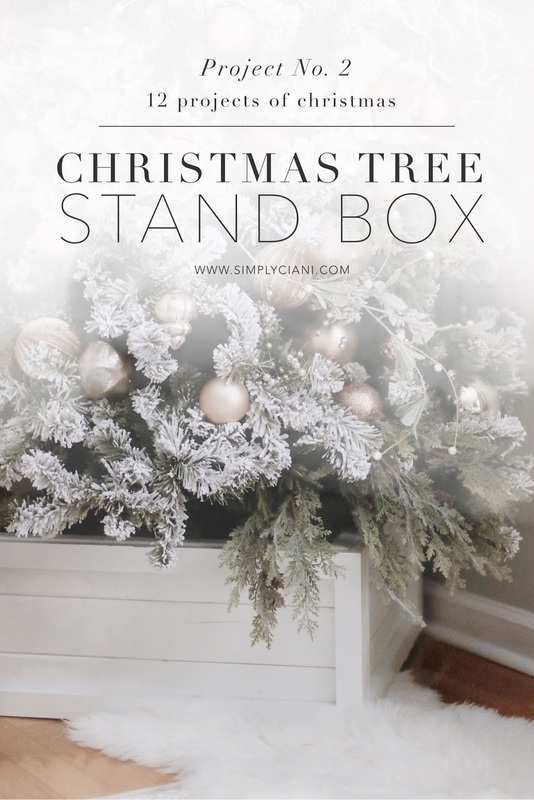 Now you have a beautiful box to display your Christmas tree in! 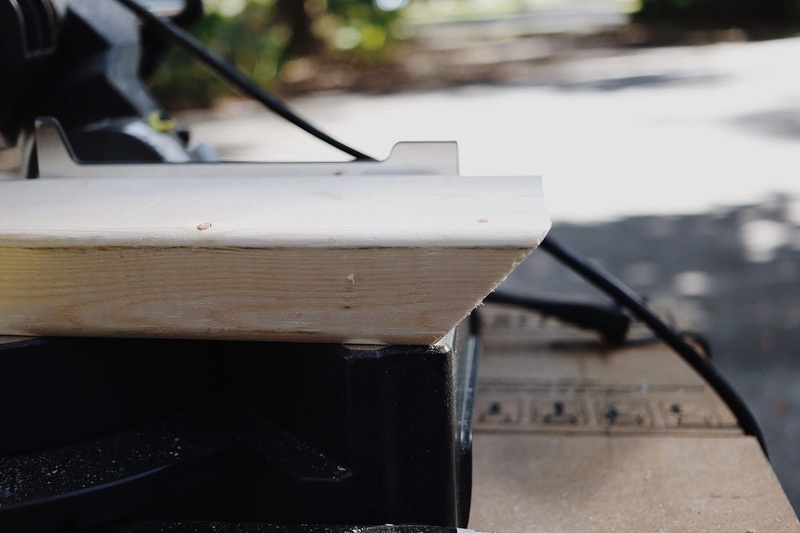 This box fits most standard tree stands, but measure yours first before starting on this project to be sure.